I knew December was coming, it comes every year....but will I be ready for Christmas? As a crafter, I love to create and share my projects as gifts but I must confess, I do not like to wrap presents. Gift bags are wonderful and easy to use so if the gift will fit, in it goes! Not all of the gifts I give are handmade, I do like to support local businesses. there are people who do not appreciate the work that goes into creating something special. After hours of making scarves (for example) I have been told by the gift recipient, "oh it's nice but I would have liked one longer to wrap around my neck twice". (Yes, I did start making that style also but other folks like the single wrap just fine). What happened along the years that made people unappreciative of a gift given from the heart? OR someone will ask me to knit a cowl or scarf and just want to spend $10....ok, if I can get the yarn for less than $1 that might be possible but really??? I do not charge an arm and a leg for my crafting projects and in fact I make many of them as special gifts but I do understand how other crafters share in the frustration regarding getting paid fairly for the number of hours they have devoted to making a special piece. On one painting group on Facebook there was a chart of how to price your items. I was excited but realize that in this small market area people still won't want to pay that. "Don't under-price", I have been told...ok, but if I price it fairly not many people want to purchase for that kind of price. So if you craft and enjoy it, be sure to continue with your passion. While not everyone will appreciate the time, effort and cost you have put into each project, you will know that it has been made with your heart and soul and that spreading the joy can be worth it (even if your wallet doesn't earn back that same joy). 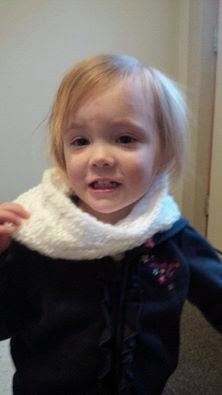 In an earlier blog post I showed a white acrylic toddler cowl that I made. I hope she keeps toasty warm! That's it for now. I am making a special Christmas plaque so need to get going. Thanks for reading! I'll be back soon!